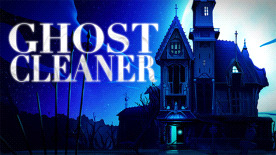 Ghost Cleaner is a combination of arcade game and puzzle game. At first glance it is very straightforward, as you use a gun to destroy pink bricks. But the game requires you to use both strategy and tactics to finish every level. Try it once, and you'll be coming back for more! • Lots of variety across all the levels. • 100 levels to complete! • Low price for fun game that's easy to play.